Atal Bihari Vajpayee, the former Indian Prime Minister and one of the founding members of the Hindu nationalist Bharatiya Janata Party (BJP), which currently governs the country, died on Thursday at the age of 93 at New Delhi's AIIMS hospital. Vajpayee was one of India's most charismatic leaders who led the nation through several crises and held together a tenuous coalition with his inclusive politics, reported PTI. A voracious reader, Vajpayee was widely known and respected for his love for poetry and as an eloquent speaker. He was conferred Bharat Ratna in 2015 in recognition of his services to the nation. Vajpayee, who had been ailing for long, retreated from active public life over the last decade following the deterioration of his health and remained restricted to his residence. He suffered pneumonia and multi-organ failure, including kidney failure. He was put on ECMO support on the last day," said a doctor on the condition of anonymity. As his health started deteriorating a host of leaders including Prime Minister Narendra Modi visited the BJP patriarch at AIIMS. Mourning his death, an emotional Modi called it a personal loss. 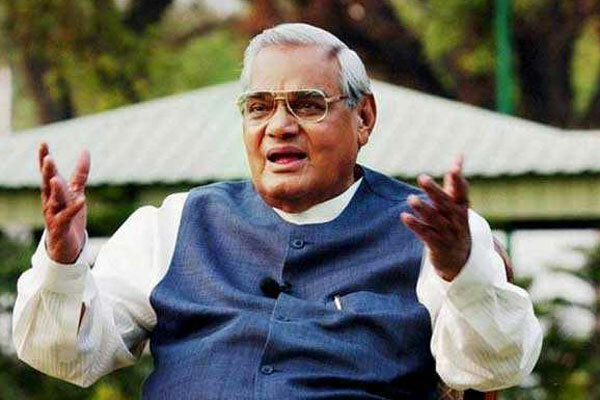 "I have no words, our respected Atalji is no more. He lived for the nation and served it assiduously for decades. His passing away marks the end of an era," he said in his twitter message. "Vajpayee's exemplary leadership set the foundations for a strong, prosperous and inclusive India in the 21st century. His futuristic policies across various sectors touched the lives of each and every citizen of India," he added. Leaving boundaries of their respective parties, political leaders today bid an emotional goodbye to Vajpayee describing him as a visionary statesman with acceptability across a diverse ideological spectrum, reported PTI. Several leaders saw a personal loss in death of Vajpayee, one of India's most respected leaders who led the nation through several crises and held together a tenuous coalition with his inclusive politics. Veteran BJP leader L K Advani, who along with Vajpayee was a central figure in the party for much of its existence, described the former prime minister as one of the country's tallest statesmen and his closest friend for over 65 years whom he will miss immensely, said the PTI report. In his tribute, President Ram Nath Kovind said the "gentle giant" will be missed by one and all. Former prime minister Manmohan Singh described Vajpayee as a great patriot and among modern India's tallest leaders who spent his whole life serving the country. Born in Gwalior city of Madhya Pradesh state on December 25, 1924, Vajpayee went on to study politics and then became a journalist and social worker while, at the same time, becoming active in the Quit India Movement, which campaigned to end British rule in the subcontinent, reported BBC. After independence Vajpayee became a close aide of Syama Prasad Mookerjee, the leader of the Hindu nationalist Bharatiya Jana Sangh party, reported BBC. He was elected to parliament in 1957 and, despite his relative youth, was seen as a rising star. Like many Jana Sangh activists, Vajpayee was detained by the Congress party government of Indira Gandhi during the so-called "emergency" of 1975-77. The Jana Sangh joined a number of political groups to form the Janata party, which swept to power in the ensuing elections. Considered a giant of Indian politics, he served as prime minister three times between 1996 and 2004 and was instrumental in making India a global nuclear power, reported BBC. Several of his own party leaders also said Vajpayee was an inspiration to millions, an intense speaker and a true diplomat. Singh, Minister of State in the Prime Minister's Office, said Vajpayee's demise is a great loss to the nation. "We grew up listening to him, learning from him,inspired by him. There was no electronic media those days, but many of our college-mates,who did not subscribe to our ideology, would come over to his rallies, just to pick up speaking skills from his oratory," Singh told PTI. Union Minister Harsh Vardhan said he has lost his "mentor and guide" who had hand-held him into politics. "A visionary statesman, with political sagacity, his acceptability across diverse ideological spectrum endeared him to all," Vardhan said.